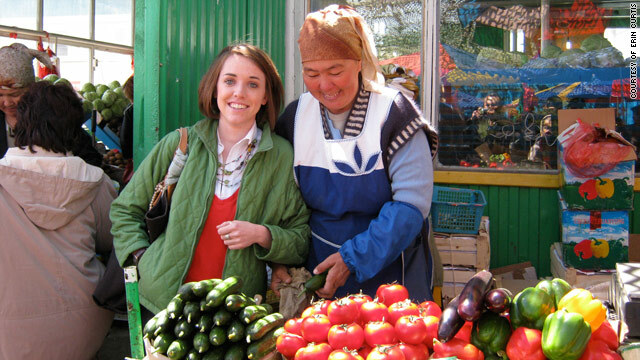 Returned Peace Corps volunteer Erin Curtis, left, shops for vegetables at a bazaar in Kazakhstan. (CNN) -- You're in a country where everything feels different. The food isn't what you're used to; the people don't make sense. It's sensory overload and you're bewildered by all the things around you -- the language, the music, the faces, the smells. Everyone is moving at lightning speed, and you're still staring at the food in the grocery store, confused about what to buy. "I walked out of the ice cream aisle because I couldn't choose," said Erin Curtis, a Peace Corps volunteer. But she wasn't talking about her time in Kazakhstan. Curtis was referring to her trip to the local grocery in Lexington, South Carolina, last month. Curtis, like many long-term volunteers and workers who return from abroad, was feeling what is known as reverse culture shock. "You get used to a certain way of life over there," Curtis said, "and adjusting to things here now is difficult. You're trying to get your feet under you and keep up with everyone else; you're trying to figure out what is going on and the stuff you missed." For tips on how to avoid falling into a deep post-travel funk, CNN.com asked for tips from the Peace Corps and volunteer travel company i-to-i, which organizes trips lasting from a week to several months or more. Waste "The ridiculous amount of trash we produce in the U.S. was hard for me to look at everyday," said returning Peace Corps volunteer Erin Curtis. Choice Many volunteers feel overwhelmed by the wide variety of choices in the U.S.
Pace of life "You feel so rushed in this culture and bombarded with things," said returned Peace Corps volunteer coordinator Jodi Hammer. Relationships Not only do volunteers miss the connections they made abroad, but they may find they've grown apart from their friends at home. Language/Communication Sometimes its hard to find the right words after speaking another language for a long time. For many volunteers and workers, coming home can be harder than going abroad, said Jodi Hammer, a coordinator for returned Peace Corps volunteers. The Peace Corps sends up to 4,000 volunteers overseas each year to work on two-year assignments. "You're expecting an exciting new culture and you're almost prepared for it. But when you come back to your country, you don't expect so much to have changed, and that you've changed," said Hammer. She said it is important to realize that it will be hard to readjust to life at home, just as it was hard to adjust when you left. According to Hammer and Curtis, everything from language to the simple choice of where to go out can be a struggle at first. "Volunteers learn a different language while they're there, and they develop quite a bit of fluency. Here, you find yourself not being able to think of the right word," Hammer said. "My writing got terrible, which was horrible when you come back and are trying to write cover letters and apply to things," Curtis said while recounting some of her frustrations upon returning. Picking an ice cream flavor or a restaurant can also be a little daunting. "I lived in a village where there were two places to hang out, and that was it. Regaining independence back in that way was sort of an adjustment," Curtis said. To help make their participants' transition easier, the Peace Corps does what it calls a close of service conference in a volunteer's host country at the end of the program to prepare volunteers for some of the hurdles of returning home. Anyone who's been abroad, even for a short period of time, knows how hard it can be to keep quiet about your adventures, but you want to be careful not to sound pretentious or affected about your stay abroad. Every time the word "recycle" is mentioned, no one really wants to hear about the Indian village you taught environmental basics in, but that doesn't mean what you learned overseas isn't important or interesting. In most situations, preventing that glazed-over look comes from knowing when and where your worldly knowledge is wanted. Hammer said speaking another language for a long time and struggling for the same words in English can cause you to start "talking in what people see as jargon, which can even be worse because you're using words they don't understand." Hundreds of returning i-to-i volunteers share their tales on Campfire, an online community the organization created for interested applicants to learn about the possibilities of going abroad through first-hand accounts. i-to-i trains about 6,500 people a year to teach English abroad and sent 250 volunteers in the past year to China, Thailand and Poland. Forums like these are a great way to tell your stories to people who will be genuinely interested. The Peace Corps' Hammer said her biggest tip would be to know how to use your experience to network. "A lot of people think of it as dirty. It's not schmoozing; it's building your alliance, your web of people who know about you and might be able to connect you with people who know what you're about." Your family and friends didn't go abroad with you, so they may not be as pumped as you are to talk about Mozambique or Peru every three minutes. It's a good idea to find others in your same situation. There are more than 200,000 members in the Peace Corps community, and volunteer groups all over the country promote events to unite people who have common experiences. The internet connects large forums of like-minded and travel-oriented people. Join message boards, Facebook groups and online communities to meet others you can talk to about your travels and getting used to life back in the states. "If you go to our teach-abroad website ... you'll find Chalkboard, an online community for anyone who has or has ever considered teaching English as a foreign language, and members share everything, their experiences etc.," i-to-i program and marketing manager Crystal Williams said about i-to-i's community board. And don't forget that your program can also act as a counseling resource that will be there for you. "Our teams are made up of people who have experienced these same things, either going abroad, working abroad, etc.," Williams said. Organizations that send volunteers and workers abroad often have programs for participants who have returned. Many participants in i-to-i teach abroad or do community development volunteering. "Once they're certified [to teach abroad] with us, we give them lifetime access to our jobs team," Williams said. The Peace Corps' wide network of initiatives includes career development, graduate school support, loan deferment and even one year of noncompetitive eligibility for government employment. Resources don't just come in the form of programs, either. Returning workers and volunteers are a wealth of information on other cultures, languages and peoples. These can be used to great advantage -- whether it's for getting a job or meeting new people. Recently returned Peace Corps volunteer Curtis said coming to terms with the effect of her time away made her able to readjust to life at home. "Once I realized I was never going to go back to being a certain way, it really helped with who I was and how I fit in here."